Watchdog: U.S. 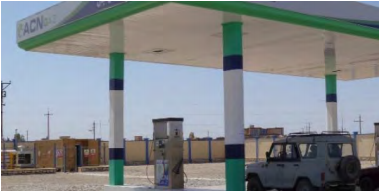 Paid For 'World's Most Expensive' Gas Station In Afghanistan : The Two-Way American taxpayers paid $43 million for a natural gas station that should have cost $500,000. When the inspector general asked about it, the Department of Defense could not explain the cost. "DOD charged the American taxpayer $43 million for what is likely the world's most expensive gas station." That's what Special Inspector General John F. Sopko found when he looked at the construction of a natural gas station in Sheberghan, Afghanistan. According to the report, at most that station should have cost about $500,000. But in this case, the Department of Defense's Task Force for Stability and Business Operations awarded Central Asian Engineering a contract to build the station for a little under $3 million. "The Task Force spent $42,718,739 between 2011 and 2014 to fund the construction and to supervise the initial operation of the CNG station (approximately $12.3 [million] in direct costs and $30.0 [million] in overhead costs)." To make matters worse, the inspector general found that the Department of Defense didn't even study whether a natural gas station would be used in Afghanistan. And when the IG came asking questions, the Department of Defense said that all the people who worked on the project were gone, now, so they could not provide answers as to why a project that should have cost $500,000 ended up costing nearly $43 million. In letter sent to Sopko at a later date, the DoD does offer to try to help him find some former employees of the task force. In a letter dated Oct. 22 to Defense Secretary Ashton Carter, Sopko wrote: "Frankly, I find it both shocking and incredible that DOD asserts that it no longer has any knowledge about TFBSO, an $800 million program that reported directly to the Office of the Secretary of Defense and only shut down a little over six months ago. Nevertheless, I intend to continue our inquiry into TFBSO activities to shed additional light on how this program operated, what it achieved, how this enormous amount of money was spent, and whether any conduct by TFBSO staff or contractors was criminal in nature." -- Afghan Schools: Is The Success Story Exaggerated?